I am reading a lot of negative things on here regarding spinach and I suspect the big problem with most is they are not using ORGANIC as I have had no problem with spinach and the shrimps mob it and I have never had any deaths. IF you aren't sure then you can easily grow your own from seed on a window sill etc. If you buy it from a supermarket and it is labelled organic then it should be fine, but I would try a very small piece first time. Only takes a couple of minutes to prepare either fresh or frozen. Get a cup, put leaves in cup, pour on boiling water from kettle to just cover the spinach leaves, put in microwave on full for 1 minute and your done - simple as that. The whole leaf (I use baby spinach leaves) is gone in a day and I usually TREAT the shrimps once a week. One other thing to be wary of is 'pollution' so don't grow it near a source of pollution. Why does it have to be organic? Surly frozen Spinach would be ok from the supermarket... if humans can eat it? Or am I being silly? @TotalNewb, Organic means it should be grown without pesticides. There is a small risk that the pesticides can kill the shrimp. Small amounts of pesticide might not harm humans, but it can be lethal to small invertebrates. If there is even a small doubt whether any pesticides were used, then don't use it. But if you grow your own, then you know if it is safe or not. Just fed the newly integrated crystal shrimps spinach yesterday. We have arrived at the 2 week mark since their arrival and all 20 of them are alive and well! This is an asian variant of spinach, with purple markings on the leaves, the shrimps still LOVE them the same! These were gone in 1hour! It was a sight to behold as all the crystals quickly grabbed onto the leaf. Those are some beautiful coloured and quality shrimps. We were told the same 'spinach helps you see in the dark' when we were children, but that never made me keen to eat it? 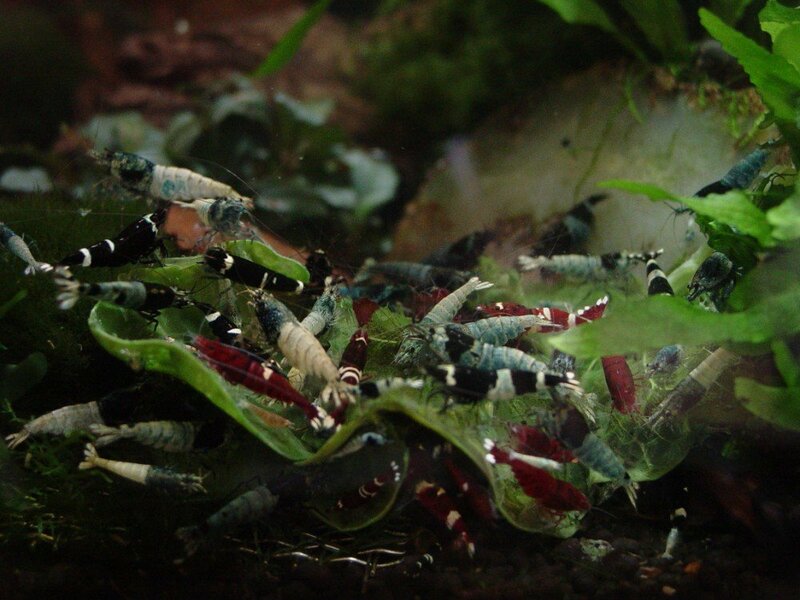 If you ever want to see how many shrimps you have use some spinach as they charge towards it and it brings them all out! Ha! At 35 now, this has become an accquired taste really, dont love it but i eat it anyways! The monte carlo has come to a halt in carpeting because i have taken off co2 injection on this tank. This is still a debatable topic i suppose but personally i experienced better shrimp survival without it. Perhaps i was injecting it wrongly. But i guess the survival and well being is of greater importance to me right now. Just getting the hang of maintaining stable water parameters for these guys, i guess co2 injection and its management will come later for me. I do need to read up more on managing it before i actually go back to injecting the tanks. Need to find that peaceful balance for the two. You could try to introduce the co2 very very gradually to the yellow tank, it may even reduce the breeding which will be helpful in keeping numbers manageable? As long as the carpet plants don't die off completely then slowing them down (ie no Co2) may mean a lot less maintenance not to mention cost etc so may work in your favour? 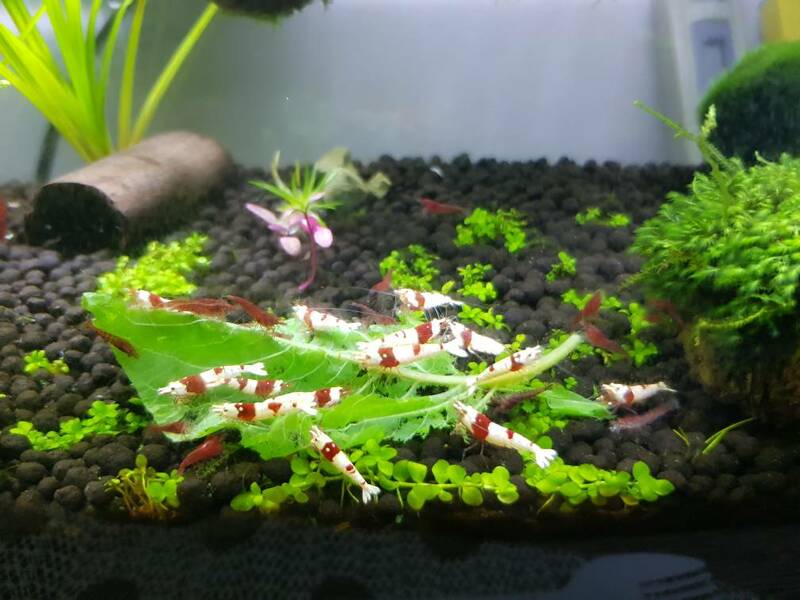 I don't think I have ever heard of anyone using Co2 as a good thing for shrimps though, so there may be a compromise needed?